The mounts are portable, without any holes, screws or hassle. You can move them between your boat, pontoon or kayak, without loosing the integrity of the suction. The Griplox Clamp Mount Drink Holder offers a new way to hold your drinks, while on the water. There are never enough drink holders on a boat and if there are, they are never where you need one. This 360-degree drink holder not only provides you with an additional beverage holder in your boat, but you can also place it where you need it most. The Clamp Mount Drink Holder features our strong and durable clamp technology that works on any round or square rail from 15-45 mm in diameter. The drink holder is made of stainless steel, which will prevent the mount from rusting. Bracketron is also introducing a suction version, which can adhere to smooth or textured surfaces. The Griplox Waterproof Suction Mount Phone Holder is designed to keep your smartphone or other portable devices safe and dry while on the water. This phone holder features our Temporbond technology that allows you to mount it on most smooth or textured surfaces. You can also view your device in portrait or landscape mode with the 360-degree rotating head. The device holder easily detaches from the T-Notch base, making it portable wherever you go. It also includes a neck lanyard and floating wrist tether, now your smartphone won't end up at the bottom of the lake. 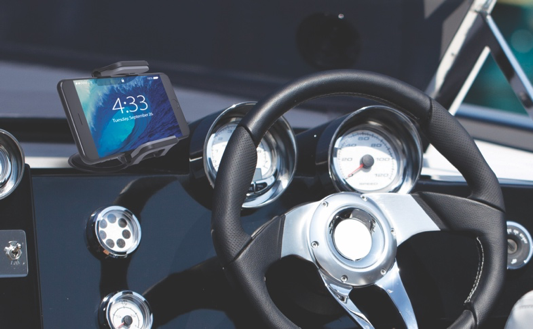 The Griplox Suction Mount Phone Holder will securely hold your smartphone or other portable devices, giving you access to all your controls while boating. This mount is perfect for streaming music, making phone calls and navigation. You can easily remove this mount and place in other boats or vehicles. This line of products also features Suction Mount Tethers for your hats, life jackets, paddles and more on the boat. The marine line is rounded out with the Suction Mount Tech Tote that is designed to store all your valuables when not in use. The Griplox products are $24.99 and available on Bracketron.com.